Summary and Definition: The 1916 Keating-Owen Child Labor Act was a federal law passed during the era of the Progressive Movement that restricted how many hours children were allowed to work by prohibiting the employment of children under the age of fourteen in factories producing goods for interstate commerce. It was the first federal law regulating child labor. The Supreme Court later declared the Keating-Owen Child Labor law unconstitutional on the grounds that child labor was not interstate commerce and therefore only states could regulate it. Woodrow Wilson was the 28th American President who served in office from March 4, 1913 to March 4, 1921. One of the important New Freedom progressive reforms, attacks against unfair business practices and federal laws passed during his presidency was the Keating-Owen Child Labor Act. 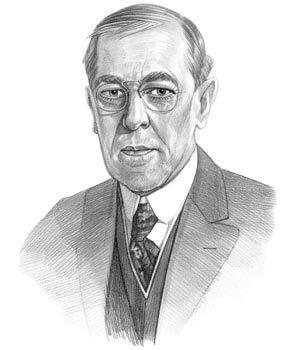 President Woodrow Wilson, like his predecessors Theodore Roosevelt and William Taft, was a firm supporter of the Progressive Movement and Progressive reforms. His New Freedom polices included the passing of the federal law known as the Keating-Owen Child Labor Act. During the Progressive Era, public sentiment in America protested against intolerable industrial child labor conditions and President Wilson was determined to take action but was unable to regulate hours and working conditions for child labor within individual states. The Keating-Owen Child Labor Act was the first federal law that attempted to regulate child labor by banning the product of that labor from interstate commerce.. The history and causes of child labor in America together with together with the Types of Jobs undertaken by children and the wages paid and hours they worked are fully detailed in our article on Child Labor. Who sponsored the Keating-Owen Child Labor Act? The Keating-Owen Child Labor Act was sponsored and named for the progressive Representative Edward Keating from Colorado and Senator Robert Latham Owen from Oklahoma. To get the bill through Keating and Owen used the constitutional clause giving Congress the task of regulating interstate commerce. Keating-Owen Child Labor Act for kids: Why was the amendment to the law passed? Before the Keating-Owen Child Labor Act was passed thirty-six states had banned the industrial employment of children under 14 years old, and eighteen of these states had also limited the working hours of children aged fourteen to sixteen. The federal law was needed to force states that lacked industrial child labor laws to also regulate the employment of labor. Many states in the South were reluctant to pass such laws as competitive economic advantages would be lost. The bill was vigorously opposed by textile manufacturers in the south. The Keating-Owen Child Labor Act was declared unconstitutional by the Supreme Court in the Hammer v. Dagenhart case on the grounds that child labor was not interstate commerce and therefore only states could regulate it. The significance of the Keating-Owen Child Labor Act was that it began a new program of federal regulation in industry. The info about the Keating-Owen Child Labor Act provides interesting facts and important information about this important law that was passed during the presidency of the 28th President of the United States of America. The article on the Keating-Owen Child Labor Act provides detailed facts and a summary of one of the important progressive reforms and federal laws passed during his presidential term in office. The following Woodrow Wilson video will give you additional important facts and dates about the political events experienced by the 28th American President whose presidency spanned from March 4, 1913 to March 4, 1921.